Atrius Health is the Northeast’s largest nonprofit independent multi-specialty medical group. 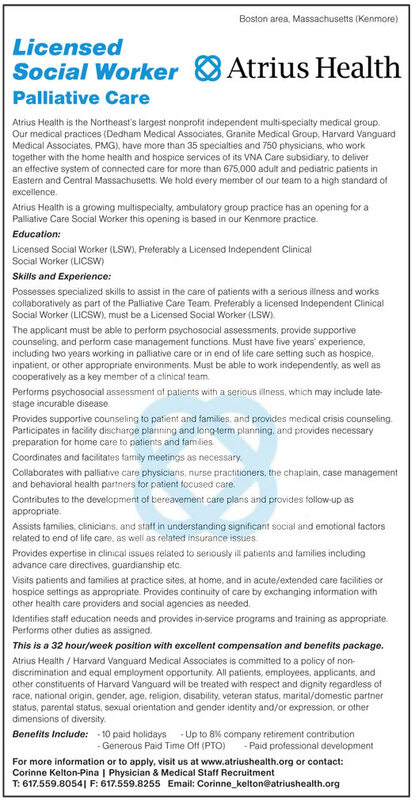 Palliative Care Social Worker this opening is based in our Kenmore practice. Social Worker (LICSW), must be a Licensed Social Worker (LSW). cooperatively as a key member of a clinical team. Provides supportive counseling to patient and families, and provides medical crisis counseling. preparation for home care to patients and families. Coordinates and facilitates family meetings as necessary. and behavioral health partners for patient focused care. related to end of life care, as well as related insurance issues. advance care directives, guardianship etc. other health care providers and social agencies as needed. Identifies staff education needs and provides in-service programs and training as appropriate. This is a 32 hour/week position with excellent compensation and benefits package.